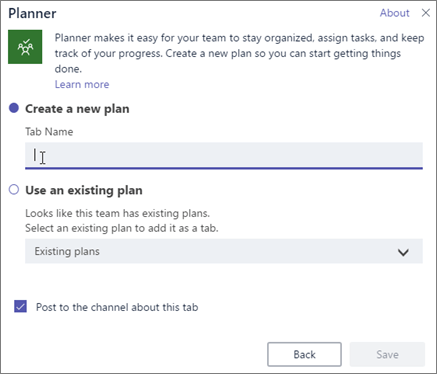 If you're using Microsoft Teams, you can organize your tasks by adding one or more Planner tabs to a team channel. You can then work on your plan from within Teams or in Planner for web, remove or delete your plan, and get notified in Teams when a task is assigned to you in Planner. See Microsoft Planner help for details on how to use all the features of Planner. In your team channel, select Add a tab +. In the Add a tab dialog box, choose Planner. Create a new plan to make a new Planner plan and add it as a tab to this channel. Use an existing plan to choose an existing Planner plan to add to a tab in this channel. Choose whether to post to the channel about the tab, and then select Save. The tab will be added alongside your other team channel tabs, and you'll be able to start adding tasks to your board. Repeat this procedure to add as many plans as you want for your channel. Note: You can also add the same plan to multiple tabs. This doesn't create a copy of your plan. The Planner tab in the channel: You can perform the basic Planner actions, such as adding buckets, tasks, assignments, and more. To use the more advanced Planner features, such as Charts and Schedule, you'll need to open your plan in Planner for web. Following is a list of plan actions in Teams versus Planner for web. Planner personal app: In Teams, in the left column, choose More options ..., and select Planner. On the My Tasks tab, you can see all of the tasks assigned to you in Planner. The Recent and All tabs show you Teams-created plans you've recently looked at and a list of all plans you're a part of in Teams. Select About to find out more about the Planner app in Teams. Following is a breakdown of the functionality available when viewing through Teams versus viewing through Planner for web. For more details on the Planner features and what you can do with them, see Microsoft Planner help. After you've created a plan in a Teams channel, you can access that plan both from Planner for web and from Teams. 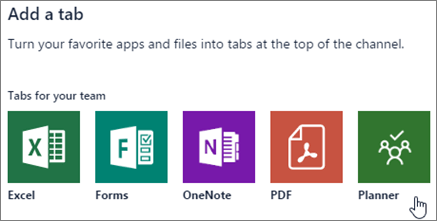 From the Office365.com website: Sign in at office365.com and choose the app launcher, and then select Planner. In the Planner Hub, scroll to find your plan either under Recent plans or All plans. When a plan is created in Teams, the team and team channel names will appear beneath the name of the plan in this format: "team > team channel". (If your plan was created before February 2018, you may not see these names until a plan member opens the plan in Teams after that date.) Select the plan tile to open the plan in Planner for web. Note: In the past, it was difficult to navigate to your Teams-created plan from the Office365.com website. Sometimes you could not find the plan, or if you found it, it appeared empty. All Teams-created plans now appear in Planner Hub. If you find an empty plan associated with your team, it may be a placeholder plan created when your team was created. If the plan is a placeholder, the name of the team or team channel may not appear on the plan's tile in All plans. From the plan tab in Teams: In Teams, select your team and channel and select the plan tab you want. To the far right of your tabs, choose the Go to website icon. A browser window will open showing your plan in Planner for web. On the channel tab where you created it: In Teams, select your team and channel, and then select the plan tab. From the Planner personal app: In Teams, in the left column, choose More options ..., and then select Planner. Choose All and then scroll to find the plan you're looking for. Go to the Planner Hub and scroll down to find your plan in Recent plans or All plans. 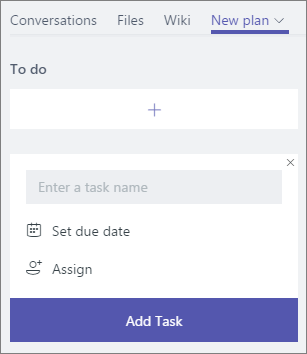 On the plan tile, select ..., and then select Open in Microsoft Teams. Find and open your plan in Planner for web. 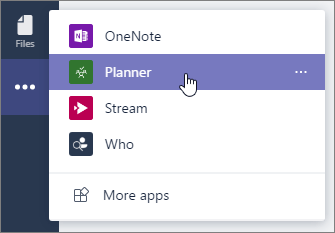 Then, at the top of the plan, select ..., and then select Open in Microsoft Teams. When you're done using a Planner tab in Teams, you can either remove it from your team channel but keep the underlying plan, or you can remove it from your channel and permanently delete the underlying plan. In your team channel, select the Planner tab you want to remove or delete, select the arrow next to the tab name, and select Remove. 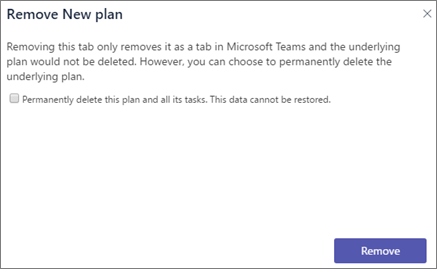 To remove the plan from the team channel: Clear the Permanently delete this plan and all its tasks. This data cannot be restored. check box. This check box shouldn't be selected when you open the dialog box. The plan will no longer show up in Teams but it will appear in Planner for web. To remove and delete the plan: Select the Permanently delete this plan and all its tasks. This data cannot be restored. check box. The plan will no longer exist either in Teams or in Planner for web. You can get a Teams notification when a Planner task is assigned to you by another person if your team has Planner installed and your plan has a tab in Teams. In Planner for web, select Settings, and then under Planner, select Notifications. Make sure the Someone assigns a task to me check box is selected. For more about Planner email and notifications. Appear in the Teams Activity feed. Appear in a chat with the Planner app (you can look here to see a record of past assignment cards). Contain the task title, who assigned you the task, the plan the task belongs to, and a link to open the task details in Teams. Not replace your email and mobile push Planner task assignment notifications; you will receive all three. Even if the task assignment action occurs outside of Teams (for example, in Planner for the web or the Planner mobile apps), if the plan has a tab in Teams, a Teams notification will be sent to the assignee. If you are not seeing Teams notifications for a specific plan, please try uninstalling and reinstalling the Planner app for the team associated with that plan to ensure the Planner bot is added to the team. If you do not want to receive Teams notifications for task assignments, you can mute or block the Planner bot to stop Teams notifications from Planner. If you’re an Office 365 admin and you want to turn off Planner Teams notification, you can turn off the Planner app for Teams. If you want to turn off only the Planner assignment notifications in Teams, but leave the Planner app turned on, contact Office support.